Discussion in 'Off Topic' started by Mercerenies, Jun 26, 2016. Welcome to the forum game about stealing money and making wishes! Want to know how? Read on! Note: Veteran players, very little has changed. Pretty much the only major change is that the Altar is now sacred, like the Start square, and cannot contain items or traps. Feel free to skip the rules if you've played before. The game starts on a very simple board. That red "A" on the map is the Altar. If you land on the Altar, you can make a wish that alters the nature of the game board. Subject to a few restrictions, your wish will be granted as you specify it, and you'll be returned to Start. That's you. Each player begins the game with 10 HP, 2 ATK, 0 DEF, 5 MOV, 5 inventory slots, and 0 gold coins. What do all these stats mean? * HP - This keeps you alive. If it hits 0 (or below), you die. * ATK - If two or more players land on the same square, they automatically exchange blows. Both players simultaneously deal damage to the other's HP equal to the attacker's ATK monus the defender's DEF. * DEF - Subtracted from damage dealt in battle. Note that, in general, DEF is not subtracted from damage dealt by status effects or space effects. * MOV - This decides how far you get to move in a turn. * Inventory slots - You can hold items in your inventory. Items can be used during your turn. Note that gold coins do NOT count as items. * Gold coins - This is the number of gold coins you have. Gold coins don't have any individual effect; they just determine your current score and who's winning. When a player's HP hits zero, that player dies. Any gold coins or inventory items he had are scattered throughout the playing field at random, and the player himself returns to Start with full HP. Pretty much any wish is fair game when you reach the Altar, but there are a few rules. * Wishes can only affect the game board. Player inventories, stats, basic game rules, etc. cannot be directly affected by wishes. * Gold coins cannot be created nor destroyed. Existing gold coins on the map cannot be moved, and the spaces they occupy cannot be changed. * Altar and Start squares cannot be created, destroyed, or altered in effect. The existing ones can be moved about, however. * There must always be a path by which a new player starting with no items could feasibly get from Start to the Altar. * Spaces, items, wishes, and any effects cannot discriminate by user identity or username. * The Start square and the Altar cannot contain any traps, items, or other effects except those attributed to it at the start of the game. * A wish that would take more than 48 hours to evaluate at a reasonable pace is negated. In general, if you make an invalid wish, I'll try to let you know so you can fix it. Items are things you can pick up from various spaces. Picking up an item on the same space is a free action and is optional; that is, it doesn't cost MOV to do it and you don't have to if you don't want to. Item effects must obey all of the same rules that wishes must obey, with the caveat that items, unlike wishes, are permitted to modify player inventories and stats. That is, it is illegal to wish for a player to lose HP, but it is perfectly legal to wish for an item that, when used, subtracts HP from a player. Anyone can join at any time. When you join, provide a 16x16 sprite for your game token (or request that one be made for you), and you'll start on the Start square. You can go ahead and post your first turn's actions as soon as you join; there's no need to wait for my affirmation. Everything below this point is reference material. You don't need to read it to understand the game. Game Reference - Here you can find specific space, item, and token effects, in one convenient location. Misu and Lukasmah like this. I wish that all the white space turned into sentient, screaming spaces that are always in agony. Oh, the starting rules are more complicated than I remember. In. Edit: " If two or more players land on the same square, they automatically exchange blows." Wouldn't that make the starting space unsafe? Also, there's no mention of shops except in the original game spaces spoilers, which means that you do actually need to know what's written there. EDIT: 3 up 1 left, no pic just make something for me I guess. Edit: Found the sprite I used in the first game. * Agony Space (pink space with black screaming face) - Whenever a player passes this space, it cries out in agony and deals 1 damage to that player and any player on an adjacent or diagonally adjacent space. * roytheshort moves up four spaces, and then almost walks off the map when he tries to move a fifth. Fortunately, the GM is feeling merciful today. * All empty gaps are now Agony Spaces. * I think I know which restriction you're talking about, Lukasmah. Yeah, I'm going to try without that and just have a soft rule of "don't completely destroy everything in one wish". * The start space (and the altar) has a specific rule that says players who share it don't fight. * I suppose you're right about the shop, but there's just nowhere good to put it in the rules that doesn't seem out of place. But for those of you who are reading this and haven't played before, the shop gives you a random item, for free. It's really not a very profitable investment from the shopkeeper's perspective. I wish for an Elemental Space to appear such that it is accessible from the Start Space without crossing either Gaps (should they exist) or Agony spaces, but could appear anywhere where that condition is met, aside from not replacing the Start or Alter Spaces. If landed upon, the Elemental space grants one power for the next turn, chosen randomly. Earth: You may destroy spaces you move off of. This cannot destroy Elemental Spaces, and must leave a valid path to the alter. Fire: You gain +1 DEF and +2 ATK. Additionally, you deal 1 damage to anyone adjacent to you at the end of your move (Affected by DEF). I didn't know how to put my wish into words without it taking a lot of time when that happened, so I kept delaying it until the turn was skipped and I left. My English has improved since then, and I'm able to make that wish using only words now. But I don't have to. Not anymore. The block middle block of the middle row is the Ship's Wheel. When a player stands on it, they can control the warship. However, they can't control the ship in the same turn they themselves moved, and they can't step away from it if they moved in the same turn. The warship can sail through empty or agony blocks. It can move up to 3 blocks per turn, but it can only move forward. It can, however, also turn 90 degrees when not moving if unobstructed. Also, due to it consisting of moving tiles, there could be some confusion about its location, so I'd like to say this: During a turn, its movement is executed after all movement actions, ranged attacks etc etc, but before any board changing wishes for the next turn take place. This means that if someone wishes for something for the location it will be next turn, that wish probably can't be fulfilled. The yellow device at the front of the ship is the Jacqueshammer. It can break any tile as long as the tile is 1 block away from it, not behind it (directly or otherwise), not the starting or altar tile, breaking it doesn't destroy the route from start to the altar and there's no player on it. Destroying the tile turns it into an empty tile, not an agony tile. It's controlled by the player in control of the ship, and can't be used while the ship is moving. The tile above the Ship's Wheel is an Electrossbow. It can hit any player in a 5 x 5 square around it with a lightning bolt, which is something normal crossbow bolts should be but for some reason aren't because normal crossbows are lame. The bolt deals 1 damage to the targeted player/mob/whatever. However, it also deals 1 damage to the person using it due to its poor design and insulation. It's also unusuable for three turns after it's fired because it needs to recharge (just grey out the cyan 2x2 pixel tip during that time). It's controlled by the player standing on it, and can't be used while the ship is moving. The tile behind the Electrossbow is a Bomb Lobber. It can throw a bomb at any location on the map, but it takes a turn to reach the target and can't be used for 4 turns afterwards because it needs to reload. When fired, a crosshair is shown where it's supposed to hit because because gameplay balance is more important than in-universe justification. It deals 2 damage to any players/mobs/whatever standing on the title it hits and 1 damage to those adjacent to it. It also leaves a fire in the middle of it for 2 turns. The fire burns any players walking over it for 1 damage. The fire burns for 1 turn and deals 1 damage to anyone walking over it. It's controlled by the player standing on it, and can't be used while the ship is moving. If there are multiple players on any of the controllable tiles, the one that got there last gets control over it. Finally, the tile behind the Ship's Wheel is the Sliceum Sabre Creator. As the name implies, it creates Sliceum Sabres, and has an unlimited supply. Walking over this tile gives players the Sliceum Sabre item. Sliceum is incredibly cheap and can be sharpened really easily, but it's also fragile. The Sliceum Sabre increases the user's attack by 2, but it's so fragile that it breaks as soon as it's used to attack something or dropped. Okay, I get that this is a long and complicated wish (it's not extremely complicated or anything, but it's still complicated), but I hope it will add something interesting to the game. I get that the warship is pretty powerful, but I did my best to balance it so it's not incredibly overpowered. The one tile I'm a bit concerned about is the Electrossbow because it instantly deals ranged damage, but hey, fighting on a tile is also instant and the Electrossbow has its drawbacks and limited fire rate. I tried to make the range weapons be situationally useful and not just things that do damage from far away. Due to its delayed hit, the Bomb Lobber is designed as more of a path restricting weapon than something actually useful for dealing damage, and the cost of using the crossbow only makes it useful at certain times. Do you know how incredibly tempting it is to just come in the game and re-instate the Mr.Magnus stunt? Anyhow, I might have limited time but I'll do my best to be active. I wish that wherever the golden coins are any faces of agony in the surrounding 8 squares become happy faces of pleasure." There was too much agony and sadness on this board. * Elemental Space (light gray space with multicolored diamond) - A player who lands on this space randomly receives one of the following four effects: Fire Bender, Water Bender, Air Bender, or Earth Bender. The given effect lasts only one turn. * Warship's Wheel (light gray space with brown pirate ship's wheel) - A player who started the turn on this space can use its effect. That player cannot move in the same turn if he uses this effect. 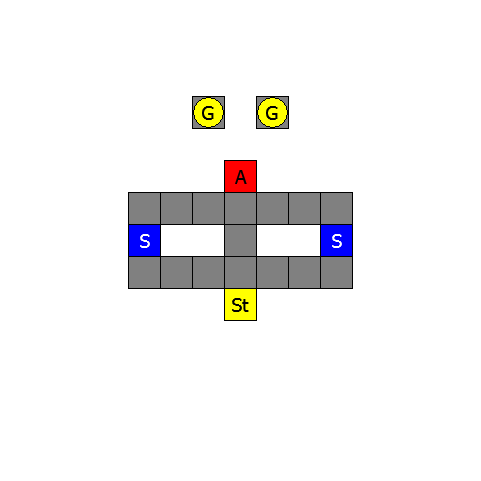 This space moves one to three spaces in a direction of the player's choice. If there is a Jacqueshammer adjacent to the Warship's Wheel, the Wheel can only be moved in the direction of the Jacqueshammer. Any warship parts that are connected to this space, either directly or indirectly through other warship parts, are moved the same distance in the same direction whenever the Wheel moves. Alternatively, in lieu of moving or moving the Wheel, a player on this space can rotate the warship, either 90 degrees right or left. All directly or indirectly connected warship parts rotate around the Wheel. Any movements or rotations of the Wheel happen after all player movements but before wish granting. This is a warship part. * Warship's Hull (light gray space with no distinctive features) - This space also counts as a neutral space. It is considered an warship part. * Jacqueshammer (light gray space with drill/hammer in the middle) - A player who is controlling a connected Warship's Wheel can use this space's effect once per turn, but not during the Warship's movement. That player can select any space adjacent to Jacqueshammer that is not a Warship's Wheel and that has no players on it. That space is destroyed and replaced with a gap. This is a warship part. * Electrossbow (light gray space with blue glowing crossbow) - This space can be activated by a player who ends his turn on it. 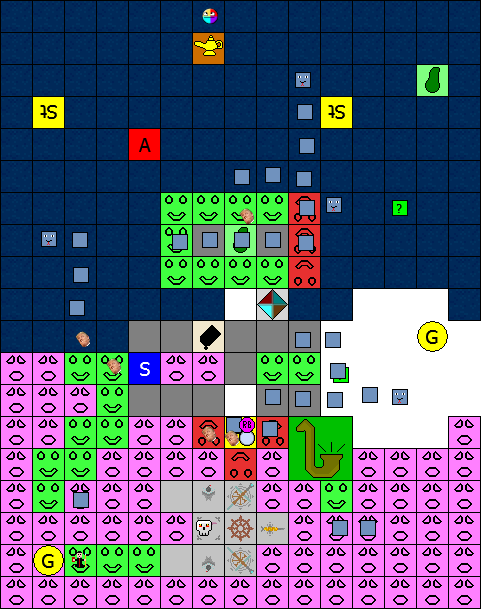 That player selects any player within a 5x5 square around the Electrossbow (that is, any player whose Chebyshev distance from the firing player is less-than-or-equal-to 2). The target player or token takes 1 damage, and so does the firing player. The Electrossbow then becomes an Inactive Electrossbow. This is a warship part. * Inactive Electrossbow (light gray space with blue glowing crossbow and dim tip) - This space becomes an Electrossbow three turns after its creation. This is treated as a warship part. * Bomb Lobber (light gray space with slingshot and bomb) - This space can be activated by a player who ends his turn on it. 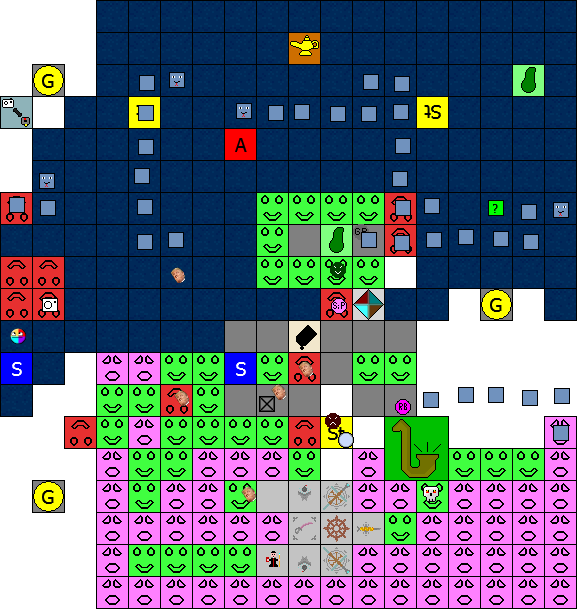 That player selects any location on the map. That location is marked with a crosshair, and the Bomb Lobber becomes an Inactive Bomb Lobber. At the end of the next turn, the crosshair space is bombed. Any player on the bombed space takes 2 damage, and any player on an adjacent space takes 1 damage. 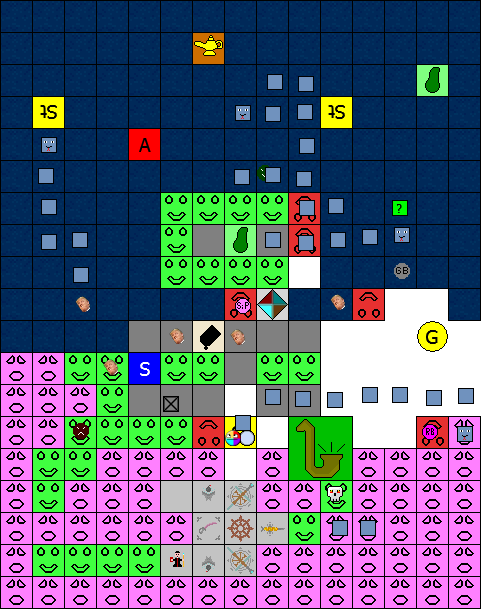 Additionally, a fire appears on the bombed space which lasts two turns and deals 1 damage to any player who passes it. This is a warship part. * Inactive Bomb Lobber (light gray space with slingshot and bomb and X over them) - This space becomes a Bomb Lobber four turns after its creation. It is treated as a warship part. * Sliceum Sabre Creator (light gray space with pink framed sabre) - Any player who passes this space automatically receives one Sliceum Sabre. This space is a warship part. * Happy Face of Pleasure (green space with black excited smiley) - These spaces love being stepped on, but not too much. Any player who passes this space gains 3 HP as a result of shared happiness, but if two or more different players pass it in the same turn, it becomes a Grumpy Face of Rudeness. * Grumpy Face of Rudeness (red space with upside down smile) - These spaces hate being stepped on. As soon as a player moves onto this space, it will teleport to a random position on the board, taking that player with it. The position will be a gap if possible but will replace another space if necessary. The player who passed this space will continue his movements normally from the new position. * Sliceum Sabre - +2 ATK. This item is destroyed if it is ever dropped or used in combat. * Fire Bender - +2 ATK, +1 DEF as long as you have this effect. At the end of your turn, you deal 1 damage to all adjacent players (mitigated by DEF). * Water Bender - +2 MOV as long as you have this effect. Items on a square you pass or land on are moved to adjacent spaces before you have a chance to pick them up, possibly falling into a gap and being removed from the field. Combat involving a player with the Water Bender status results in all involved players being healed by the amount that would have been dealt in damage. Water Spaces have no effect on you. * Earth Bender - You may destroy a space whenever you move off it. This ability cannot destroy Elemental Spaces. * Air Bender - You may choose to ignore the effects of spaces that would trigger when you pass them. * An Elemental Space has appeared near the Altar. * A warship has appeared. * Happy Faces of Pleasure have appeared around the gold coins. * Alright, I tried to do the warship so that it fit your description as much as possible. I wanted to make it so that the spaces could technically operate independently if necessary, so that if someone comes along down the road and moves the Ship's Wheel to a bizarre new place without the rest of the ship, the ship's behavior would still be well-defined. * So, fun fact. This new forum software apparently has a post length limit that's a bit absurdly short (the OP is already too long with the new space effects). I'll look into setting aside some space on my personal website for WUAS effects, but for now there's unfortunately no reference to look to. Sorry about that. Up 3 right 1 up 1. Let's see which effect I get. Up 3, left 1, up 1. I wish a giant saxophone space appeared, it's four spaces big. When you step on it, a big noise happens and everyone is cursed with Jazz for 1 turn. I wish that five Donald Trumps appeared on the board. I wish for a Happy Man, who can walk on the Sad Spaces and turn them into Happy Spaces. I wish for a Cannon Space. I wish for a Bottle of Rum that's also alive and hates updating wish upon a star. Up 4. I wish for a Boa Constructor Head ( ) to appear at a random space on the map. It can move in any direction except for diagonally, and it can change its direction multiple times during a turn. 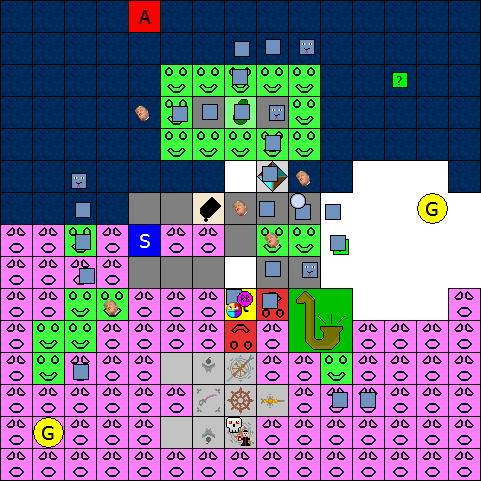 The Boa Constructor Head is like a normal solid walkable tile, but does not replace the tile underneath permanently, so the original tile will reappear once it moves elsewhere. It also deals 2 damage to any players standing on it and negates any effects of the tile under it. Its movement is random, and it is can move up to 3 spaces per turn. It can move over any block other than the altar and the starting spot. It leaves a trail of Boa Constructor Body tiles ( ). These tiles disappear 3 turns after they're created. 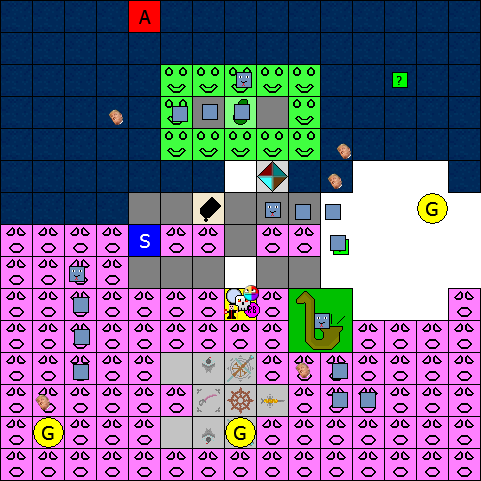 The Boa Constructor Body like a normal solid walkable tile, but does not replace the tile underneath permanently, so the original tile will reappear once it disappears. It negates any effects of the tile under it until then. I also wish for three more Boa Constructors. This post is not an update. This is definitely because I want to give Mr Magnus an extra day to post and definitely not because I'm exhausted and want to go to bed. Just announcing that the web reference for WUAS is available now. It's very bare bones, and suggestions are welcome. In particular, once the item list gets longer I plan to add a "filter" textbox at the top, but other suggestions are welcome. Why, how kind of you to wait for me. * Saxophone Space (2x2 green space with dark yellow saxophone) - When a player lands on this space, it emits a loud noise, and all players are afflicted with Jazz for one turn. * Cannon Space (light yellow space with black cannon) - A player who lands on this must choose to fire either himself or a cannonball at a space of his or her choice that is horizontally or vertically aligned with the cannon space. A cannonball will deal 3 damage to any player on the target space and, if it explodes (10% chance), 1 damage to adjacent players. The firing player will be knocked back to an adjacent space due to recoil. If the player launches himself, he will be dealt 1 damage upon landing, and any players on the target square will also be dealt 1 damage. * Bottle of Rum - This item is actually sentient. If it is in a player's inventory, it will moan and complain about how it has to help Mercerenies update WUAS. It whines so much that any space the player passes is treated as though the player landed on it. * Jazz - Jazz music is so smooth that everyone just has to walk along with the beat. A player afflicted with Jazz can only move in one cardinal direction during the turn. * Donald Trump (5 MOV) - Moves randomly each turn. Any space he passes has its uniqueness and identity ruined and becomes a neutral space. * Happy Man (5 MOV) - Moves randomly each turn. If he passes a Grumpy Face of Rudeness or an Agony Space, it becomes a Happy Face of Pleasure. * Boa Constructor Head (3 MOV) - Moves randomly each turn. Will never move onto Start or the Altar. Any player who ends his turn on the same space as this token takes 2 damage. Whenever this token moves, it leaves behind a Boa Constructor Body tile. Any effects of the underlying space are negated as long as this token occupies the space. * Boa Constructor Body (3 HP) - Loses 1 HP at the beginning of every turn. Any effects of the underlying space are negated as long as this token occupies the space. * An Agony Space cried out in pain as Kepons stepped on its face. Kepons took 1 damage. * Mr Magnus made a Happy Face very happy, but his HP was already maxed out. * A Saxophone Space has appeared. * Donald Trump appeared five times. No one is really sure how he got his hands on a cloning machine, but rest assured there will be an investigation. * A Happy Man, the total opposite of Donald Trump, appeared. * A Cannon Space has appeared. * A Bottle of Rum appeared. * Several Boa Constructor Heads appeared. * Lukasmah, I believe I misunderstood part of your warship description then. When I read "one block away" or "adjacent", I automatically assume that that only includes adjacent but not diagonally adjacent tiles, which would automatically exclude the Electrossbow. * As a reminder, squares like the Saxophone Space count as a single space. With a normal 1x1 space, there are four ways to enter and four ways to exit. With the Saxophone Space, there are eight ways to enter and eight ways to exit. I wish for the effect of Donald Trumps to be less (or not at all) damaging to the board and for the damage he has caused so far to be fixed. I want his effect to be this: Whenever he is on a neutral space, he has a chance of leaving a wall token with 0 ATK 0 MOV 3. The wall token can not be walked over. Any players attempting to do so will be stopped and forced to stay at the same tile as the wall. Players on the same tile can then move freely next turn. up 2 left 2 down 2 right 1. I wish for the alter to move to the spot 6 above and 2 to the left of the cannon space. As this would make it much harder (possibly impossible) to get to the alter for a new player, I also wish for the upper half of the board's Agony faces were replaced with Salt Water spaces. Salt water spaces are treated as water spaces, but non-amphibious tokens will try to avoid them. left, up, pick up coin, and if I can still move after picking up a coin move three to the right and pick up the other coin. Any effects of the underlying space are negated as long as this token occupies the space. It's also treated as a neutral tile no matter what's under it, even if it's an empty tile, right? I wish a plane crashed into the board and caused a big mess! Can more than one person pick up the same coins? If not, Rougebare already did. I wish for every Agony Space to turn into a Happy Face of Pleasure when a player steps on it. I wish that the space above the starting space becomes a gap. * Donald Trump (5 MOV) - Moves randomly each turn. Whenever he passes a neutral space that does not contain a Wall token, there is a 10% chance that he will create a Wall token there. Donald Trump is immune to the effect of Wall tokens. Any player who passes Donald Trump or who is passed by Donald Trump gives 1 gold coin to Donald Trump (if he has any) and returns to Start, where he finishes his turn. Donald Trump will never move onto Start or the Altar. * Wall (0 ATK; 0 MOV) - Any player who moves onto a space containing a Wall cannot move any further on the current turn. * Salt Water Space (dark blue space with watery texture) - This space counts as a Water Space. That is, a player who moves onto this space must stop here. Non-player tokens who move randomly will avoid Salt Water Spaces if possible. Tokens with "Boa Constructor" in the name are not affected by either of the effects of this space. * Airplane - Single use. Select any non-gap space that is currently visible on the board. The airplane takes you to that space. You may not move and use Airplane in the same turn. * Pear Space (light green space with dark green pear) - A player who lands on this space gets a Tomato. * Agony Space (pink space with black screaming face) - Whenever a player passes this space, it cries out in agony and deals 1 damage to that player and any player on an adjacent or diagonally adjacent space. Afterward, it becomes a Happy Face of Pleasure. * rougebare makes a lot of spaces happy and then causes agony on the space to the left of the Altar. rougebare, Mr Magnus, Lukasmah, and Kepons take 1 damage each. * rougebare claims two gold coins. * Between rougebare and a Boa Constructor Head stepping all over it, the Happy Face of Pleasure between the two former gold coin spaces has become angry with everyone. * Donald Trump has a new effect. All damage done by him is undone. Don't you wish this wish actually worked in real life? * The Altar has moved. * Salt Water spaces have appeared. * The space above Start is now a gap. * A plane crashed into the map. Happy Man fell into the resulting hole. The plane is available on the map as an item now. * The one Grumpy Face on the board became a Pear Space. * The effect of Agony Spaces has been modified. * rougebare is no longer a Water Bender. * More gold coins have appeared. * I had not considered the possibility of the Boa Constructor moving over empty gaps. This will be clarified in the effect text. * I debated whether Lukasmah (on the Altar) can take damage from an adjacent Agony Space and ultimately elected that the Agony Space is not a "trap on the Altar" so it still affects Lukasmah. * I'm not going to attempt to keep track of all of the Boa Constructor Bodies in the token list. It should usually be fairly clear how much HP they have. * Lukasmah, you set the Wall stats at "0 ATK 0 MOV 3". I'm going to assume that the 3 is the typo and you meant "0 ATK 0 MOV". * Trump can no longer enter the Altar because that would be unfair if he happened to pass the Altar and negated all player wishes that turn as a result. * To be clear, the Airplane continues existing because the Boa Constructor Body negates the "gap" effect of the gap and treats it like a neutral space. When the Body disappears, the Airplane will fall into the void. * The fire department would like me to inform you all that Start is overcrowded. I'm intentionally staying put this turn. Lukasmah, you set the Wall stats at "0 ATK 0 MOV 3". I'm going to assume that the 3 is the typo and you meant "0 ATK 0 MOV". What I actually wanted to write was "0 ATK 0 MOV 3 HP". Because token. And because indestructible walls with so many trumps on the board would be annoying. Right, up, right, 2 up. 4 down to start a gentleman's fight with Lukas. * rougebare stands there and looks pretty. +5 style points. * roytheshort made an Agony Space cry. Took 1 damage. * roytheshort made a loud saxophone noise, but nothing happened. * Lukasmah made an Agony Space cry. Took 1 damage. * Lukasmah got a gold coin! * Kepons got 3 HP from the Happy Face but then lost 1 from the Agony Space. * Mr Magnus got 3 HP from the Happy Face. * Mr Magnus and Lukasmah have a very gentlemanly fight over an electric crossbow. Both players take 2 damage, but they shake hands at the end, so it's cool. * Trump converted some Agony Spaces. * Trump tried to get Roy to give him a small loan, but Roy couldn't afford it. Trump deported him, just for fun. * Trump glared at several parts of various snakes, and they were deported magically. * Some Boa Constructors converted more Agony Spaces. * The Happy Face that Kepons and Roy stepped on became a Grumpy Face. * The Happy Face that Mr Magnus and Lukasmah stepped on became a Grumpy Face. * That Wall HP makes the effect a lot more fair, so I'll go ahead and change it now. * Roy did not start a Jazz turn because the Boa Constructor Head negates the Saxophone Space effect. * Another odd ambiguity in the texts. Does a Happy Face of Pleasure still convert to a Grumpy Face of Rudeness if one of the players passed it while it was a different space? I'm saying yes, and here's why. The effect that says "if two or more different players pass it in the same turn" is evaluated at the end of the turn and does not concern itself with the space's effect earlier in the turn; merely its identity and who passed it on the current turn. * There are four Boa Constructor Body tokens on Start. They have no effect, since Start can't be modified. * How is it that the first turn with no wishes at all ends up being the most complicated one yet? Left, 2 up, left, up. 5 left. let the anger begin. I think Merc is already angry, he must seriously be masochistic for running this forum game. Turn 6 - Genies, Grumps, and Trumps, oh my! * Boa Destructor - As long as you hold this item, any Boa Constructor Body tokens on the space you occupy are removed from the field. This has no effect on Boa Constructor Head tokens. * Fake Start Square (yellow space with inverted black 'St') - A player who lands on this space and has exactly 1 HP can choose to fake his own death. He will trick the game into thinking that he died and respawned on the Fake Start Square. That player's HP is restored to 10, and he does not lose any of his items or gold coins. * Genie's Lamp (dark orange space with yellow genie lamp) - A player who lands on this space may select a player and choose to send him or her to either the Start square or the Altar. A player who uses this effect to target another player is subsequently sent back to Start. * Kepons made a Happy Face happy. +3 HP. He does not, however, get a tomato because snakes. * Lukasmah got a Sliceum Sabre. * rougebare took 1 damage from the Agony Space. But that made it happy; specifically, it made it a Happy Face. * The shop gave rougebare a Boa Destructor. * roytheshort made a Happy Face happy. +3 HP. * roytheshort launched himself from a cannon and ended up in the far north. The sea stretches on for several more spaces, but there are tiny islands in the sea that roytheshort conveniently ends up near. * Mr Magnus agonized several Agony Spaces. Took a total of 3 damage. * Donald Trump deported Kepons. * Donald Trump extorted rougebare out of a gold coin and then deported him, just for good measure. * Two Trumps collided and deported each other in a manuever that the media is calling... bizarre. * Trump deported some snake bodies, again. * The Happy Face beside Start became a Grumpy Face. * Three Happy Faces got very upset with Trump and the snakes and became Grumpy Faces. * So yeah, Start is now totally surrounded by Grumpy Faces. Statistically speaking, a new player should still be able to get to the Altar because most of the teleport candidate positions are escapable. * On a related note, Grumpy Faces cannot teleport to the gap containing the gold coin, since that would be altering the space a gold coin occupies, which is forbidden. EDIT: I notice after posting this that rougebare's new item should have destroyed the Start Square Boa Constructors, but since they literally don't affect the game at all mechanically it makes little difference, so I'll remove them next turn. EDIT: As it destroys any boa body i pass it's too risky to try and move further. If i understand correctly my item only affects boa bodies I land upon correct? EDIT2: Also, when all the grumpy spaces teleport away isn't the alter inaccesible? or any square for that matter. Right 1, up 2, right 2. I send myself to the altar. I don't think my wishes really get to Merc anymore, I need to try a different angle. I wish that a single token appeared on the board, of a Lawyer named Geoff Brown. Recently he gambled all his money away, he lost his wife, and his mother doesn't speak to him anymore. He is drunk and wondering chaotically about the board. Occasionally weeping. I wish that Mr Insult appeared next to Geoff Brown and followed him throwing insults at him. I wish that Super-Cool Guy appeared on the board and beat up Mr Insult. Okay ummn... I will try not to be confused but ok.
* Geoff Brown (5 MOV) - Moves randomly each turn, avoiding players when possible. If a player passes him, he will beg that player for an item which he can sell to fuel his gambling habit. If that player does not give him an item, he will sue them in a drunken rage, forcing the player to be sent to the nearest Courtroom Space. If no Courtroom Space exists on the board, one will be created randomly. * Mr Insult (30 HP; 4 MOV) - Moves randomly each turn. If Geoff Brown or Donald Trump is on the playing field, Mr Insult will favor moving toward them, with Brown taking priority. When Mr Insult stops moving, he throws an insult at any player who is adjacent or on the same space as he is. These insults are special and stick to the player. If a player has more than five insults stuck to him, he dies immediately. Insults behave like status effects and as such are removed whenever status effects would be cured (for example, when landing on the Start square). * Super-Cool Guy (10 HP; 4 ATK; 4 MOV) - Moves randomly each turn, toward Mr Insult if he exists. Super-Cool Guy is immune to Mr Insult's insult effect, and any insults that stick to him will immediately fall off. * Snake is Pink has joined the game. * A Grumpy Face rode off into the sunset with rougebare. Or, more accurately, rode off into the nearby plane crash site. * Lukasmah caused an Agony Space to be very upset. -1 HP. * Lukasmah made a Happy Face happy. +3 HP. * roytheshort asked a genie to send him to the Altar. The genie, petrified with fear at the prospect of another Roy wish, hesitates briefly but is ultimately bound by his contract. * Snake is Pink rode the magic flying Grumpy Face to the north. * Mr Magnus got a gold coin! * Mr Magnus made an Agony Space become happy and then made several Happy Faces more happy. * Donald Trump made a Wall. * Trump moved a Grumpy Face. * Between the two Trumps hitting Agony Spaces, Trump's Wall nearly died. * One Donald Trump amusingly chases a Boa Constructor's tail through the sea, subconsciously deporting snake parts on the way. * Several Boa Constructor Body tokens disappeared, taking the Airplane with them. * Geoff Brown, a depressed lawyer whose mother won't speak to him, appeared. He is in a mood to drunkenly sue some poor saps. * Mr Insult, a poor sap who Geoff Brown sued awhile back, appeared. * Super-Awesome Dude's twin brother Super-Cool Guy has appeared to bring justice to the world. * SiP, welcome to WUAS! It's mostly chaotic and slightly insane, but the basic idea is to get to the red 'A' and make a wish. Also, you aren't limited to one movement per turn; you are (by default) allowed to move five spaces per turn. If anything confuses you, there's a comprehensive list of items and spaces here and you can ask questions about anything that's unclear. * rougebare, concerning the Grumpy Space dilemma, something similar came up a few games ago. The rule for that sort of thing is that once we're down to one Grumpy Space around the Start square, that last Grumpy Space's effect won't trigger. * Kepons, rougebare moved that Grumpy Face, so you can't move in that direction. Unfortunately, that invalidates your entire move. * In case it's not obvious, Geoff Brown is the "GB", Mr Insult is the dark red frowny face, and Super-Cool Guy is the dark green smiley face (who is currently hiding behind a Boa Constructor). down 1 left 3 (onto Jazz space) up 1 onto the neutral space. Cannon self to the gold coin to the right even if it means falling into the gap. Cannon self off the left side of the map, revealing a movie set recording this. * Photo Booth (muted blue space with camera, mini-board, and bidirectional arrow between them) - A player who lands on this space can use either of its effects but cannot use both in one turn. 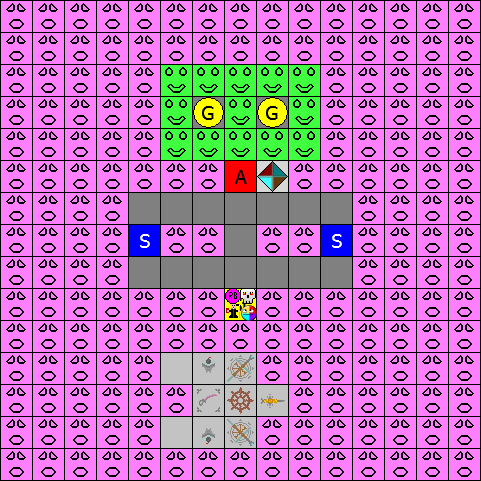 If he pays 1 gold coin, the player can choose to take a picture of the current game board, including any spaces but excluding players, items, and tokens. The picture manifests itself as an item in that player's inventory. This effect cannot be activated if the player's inventory is full. 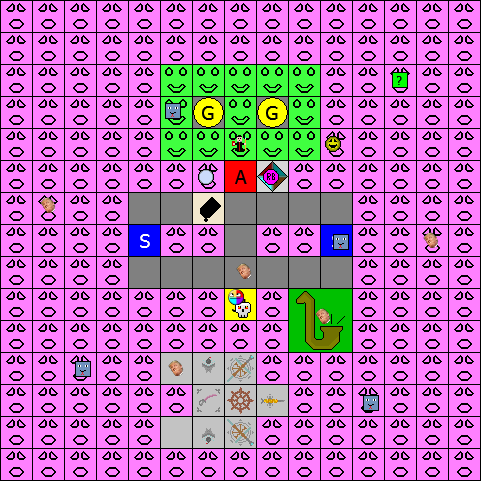 Alternatively, the player can expend a game board picture that is in his inventory. This latter effect does not require gold coins. 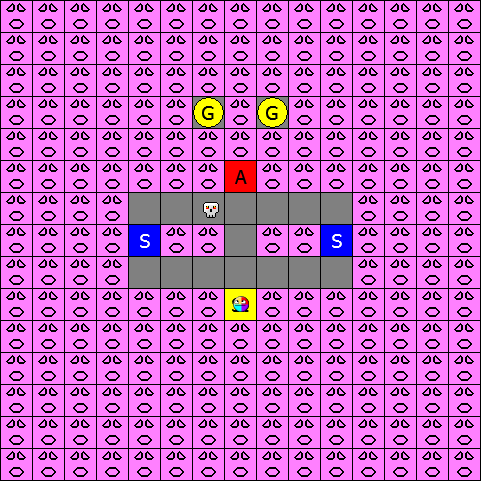 This will trigger an Event next turn in which the game board is reverted to the state shown in the picture for one turn. The picture is "anchored" at the Start square, not the upper-left corner. Any players who are forced into gaps as a result of the Event will be sent back to Start at the start of the turn with no HP penalty. * Photographer (3 MOV) - Will not move unless Mr Insult is near, in which case he will flee from Mr Insult. Every turn, the Photographer takes a picture of the playing field and retains it, as though he had just activated a Photo Booth space. A player who passes Photographer can pay 2 gold coins to buy a picture of the board during any turn that this Photographer was alive. Photographer always takes his pictures at the end of the turn, so his photographs reflect the spaces present in the update image. * Photograph - Retains an image of the board at a specific moment. Can be expended at Photo Booth spaces. When a Photograph is expended in this way, it is removed from the inventory. * rougebare took 3 damage from Agony Spaces and then killed a snake's body. * In a gambit that cost him over half his HP, Kepons launched himself at the gold coin and claimed it. He took 1 damage from the cannon and 5 from the gap and subsequently returned to Start. * Kepons got a gold coin! * Roy gained 3 HP from the Happy Face. * Roy launched himself and took 1 damage from the impact. * Roy launched himself to the left, hoping to meet the incredibly sadistic film crew recording their antics. Unfortunately, it turns out that there is no film crew, just one really dedicated guy with a camera making an incredibly long stop motion video. * Trump deported himself again. * A Boa Constructor moved a Grumpy Face. * More Boa bodies died. * Mr Insult got deported twice and then threw an insult at Kepons, but it didn't stick since he was on Start. * Two Happy Faces became Grumpy Faces. * More gold coins appeared. * The Grumpy Face cannot move when Kepons passes over it because that would violate Altar reachability. * I realized that I don't have Gap in the reference. It's been added now, and its effect formally defined. * Grumpy Face effect has been clarified slightly. If there are multiple gaps available for him to warp to, I will never warp him to a position that would leave the player stranded and surrounded by gaps. * So the basic idea behind the photograph thing is this. You can spend 1 gold coin to take a picture at the photo booth, which will retain a copy of the game board. You can then spend that picture at the same photo booth to trigger an event that returns the spaces on the board to the state they were in when the picture was taken for one turn. Alternatively, you can spend more gold coins to buy an old photograph from the Photographer and use that one instead. I spent quite a bit of time making the text on those effects precise, so hopefully it isn't terribly confusing. * I mistyped Trump as Trumpy and now I want to start calling him that forever.